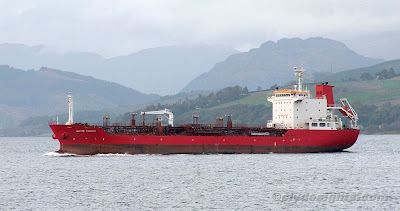 The second ship belonging to Herning Shipping that has visited the Clyde this year arrived from Brunsbuttel on Friday with a cargo of fuel, and after discharging at Rothesay Dock was seen passing downriver on Saturday afternoon. ANETTE THERESA was built in South Korea by Samho Shipbuilding, and although ordered by another company and intended to be named SONGA JADE, she was renamed upon delivery in May 2006. She is a 12,940 tonne deadweight ship, with an overall length of 127.2 metres.